I hoard vintage fabrics. I hunt them down where ever I go. I covet them for a while, then I get out the scissors and I transform them into something that can be used today so that these beautiful fabrics from the past can have another life. 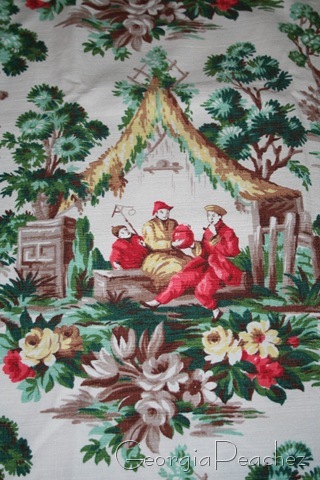 Barkcloth is a type of vintage fabric that was most frequently used for draperies and upholstery. It was mass produced so there is a lot of it still out there today. Some of my absolute favorites are the oriental designs. 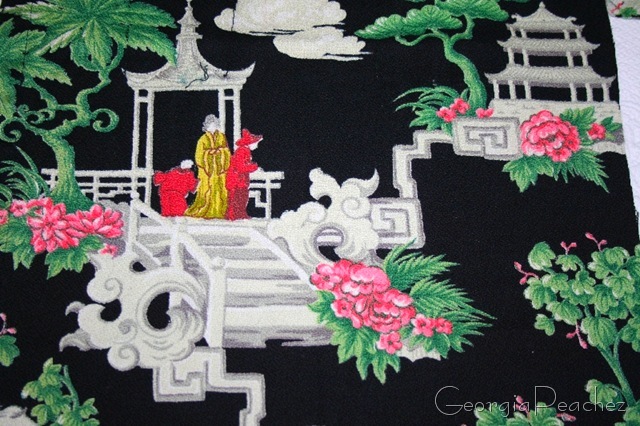 Far east designs and motifs were very popular and of course are still beautifully interpreted today in modern design. The opening ceremonies of the Olympics made me think of these beautiful fabrics. I have never seen anything as spectacular as that show in Beijing. So let me dig in my collection of fabrics and show you what I have. 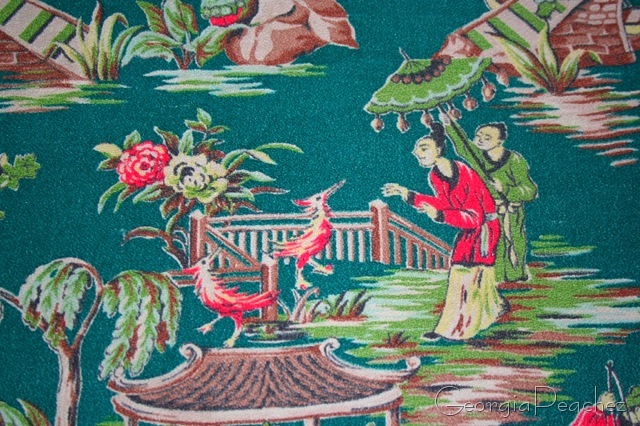 In my personal collection I have several vintage barkcloths that have these exotic designs. 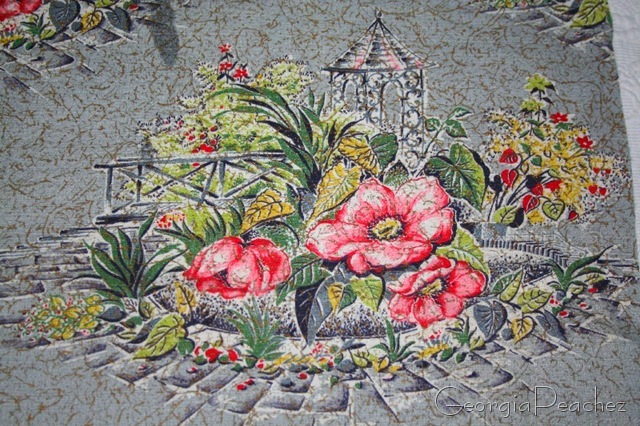 Usually the flora in these designs is the most beautiful part of the motif. This piece I like for all the activity that is going on in the design. 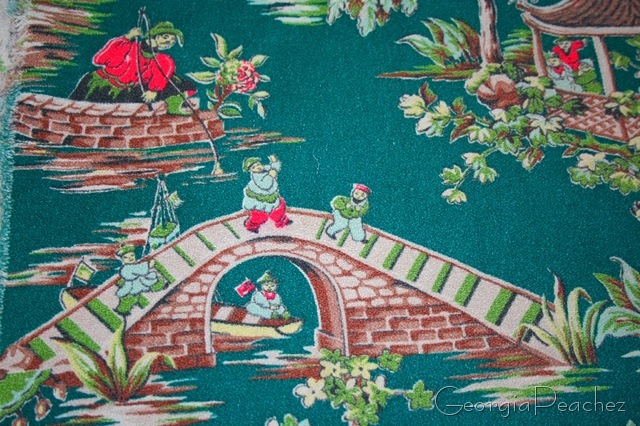 I love this next fabric, it is one of my most coveted pieces of vintage fabric. The pink flowers in it are just exquisite. This fabric also has a basket weave texture to it. 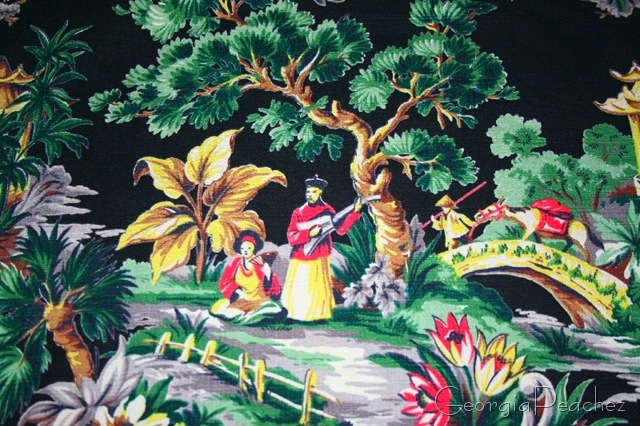 Here is a more modern interpretation of the far east theme, probably from the 50's or 60's. Barkcloth with a black background is very special. 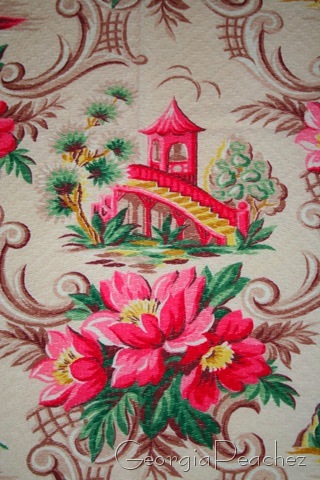 It is especially nice with the oriental designs. I have read that black barkcloth is rare, but I have come across many pieces of it. Bridges certainly were popular in the designs! Last one. This is a thick, nubby barkcloth. I love the pink flowers in this one on the black ground. Now I have the urge to go out to the garden. Our weather is beautiful today. I think I need to head to the garden center and pick out a bonsai for the patio. Beautiful collection, and what a wonderful way you have with upcycling these fabrics into your gorgeous bags! Those are fabulous! I agree with your favorite, it’s all about the pink pagoda! This was a wonderful and gorgeous post Suzy! Beautiful fabrics. Love them all. Thanks for sharing them with all of us! They do seem to mostly have garden themes, don’t they? I don’t have any barkcloth, but I keep reading about it in decorating magazines, so I know it’s wildly popular. Be interesting to see what you do with it, as always! I love those pieces of Barkcloth and I love the oriental designs as well, we seem to have been surrounded by them when we were growing up…obviously my parents liked them too. I hope when you choose your little bonsai that you then enjoy looking at it whilst sipping green tea under the shade of a parasol….it is surely tradition!! Kiss noises Linda Lilly Cottage. My heart always beats a little faster when I see barkcloth- especially the florals and tropicals- I haven’t seen many oriental designs- thanks for sharing. Oh those fabrics are really gorgeous! Sometimes it’s almost hard to cut up a fabric when it’s so wonderful! Have a great week. 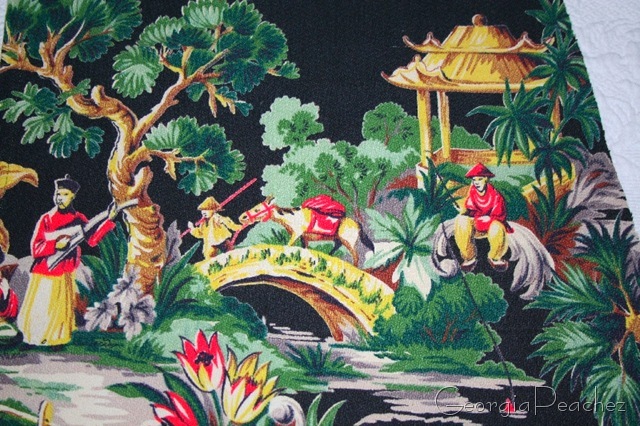 I have a couple of the oriental prints (including that first black one), but nothing as pretty as the ones in the second and third pictures…those are gorgeous! 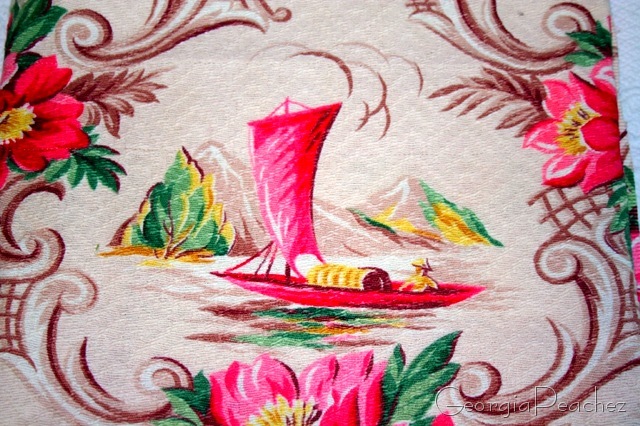 Gorgeous fabrics…I love barkcloth, too. It’s funny – it must be a long ago memory from my childhood that prompted this love of a certain fabric…was there a drape in someone’s home that was attached to a happy time? I have no idea, but it seems likely as that was the era I grew up in. Unfortunately, the prices were always too high when I would see them at flea markets, so I only have one poinsetta panel and a few small pieces with deer & scenery. I think I’d flip if I ever came across a floral beauty at a reasonable price.